John Willett (24 June 1917 – 20 August 2002) was a British translator and a scholar who is remembered for translating the work of Bertolt Brecht into English. Willett was educated at Winchester and Christ Church, Oxford. He went on to the Manchester College of Art and dance, and then to Vienna, where he studied music (Willett played the cello) and stage design. Willett began his career as a Theatre Designer. However, this career was cut short by World War II. He served in Intelligence and the Eighth Army, in North Africa and Italy. After being de-mobilised, Willett worked first for the Manchester Guardian from 1948 to 1951, and then 1960 he became the deputy to Arthur Crook, the editor of The Times Literary Supplement. Willett remained there until 1967. 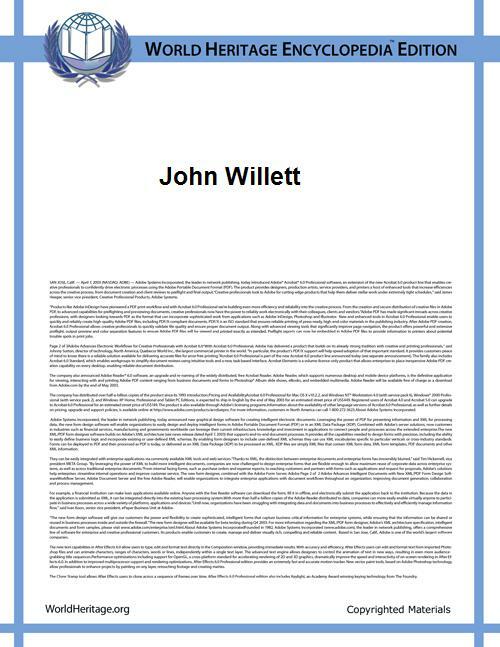 Willett became a freelance writer, an editor and translator, a Theatre director, and a visiting professor and lecturer. He was respected in academic circles for his patient work and careful research in translation, especially in German culture and politics. Famous relatives include Chris Martin of Coldplay, Jamie Willett, Matthew Willett and George Willett. Willett's love of Brecht began in the 1930s. Willett first studied Brecht's theatre design work. After the war, Willett became friends with Brecht himself, although it is said that the friendship got off to a bad start due to a disagreement about the Hitler-Stalin pact, but got back on track after they discovered that they were both interested in Tacitus. ---. 1978. Art and Politics in the Weimar Period: The New Sobriety 1917-1933. New York: Da Capo Press, 1996. ISBN 0-306-80724-6.